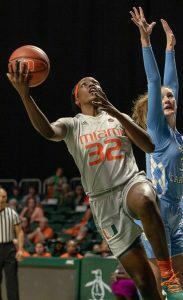 Things went much in the same way they have all season for the University of Miami women’s soccer team Wednesday night. 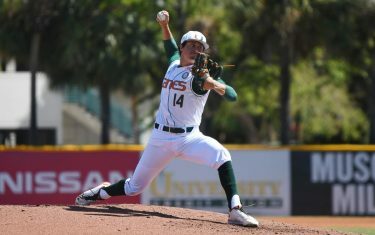 After returning from its first road trip with two wins and two shutouts, the Hurricanes defeated Purdue 2-0 at Cobb Stadium for a program-best sixth straight victory. ACC Freshman of the Week, goalkeeper Vikki Alonzo, recorded her fifth shutout in six games, while sophomore forward Brittney Steinbruch scored both goals. In a physical game where both teams got called for nine fouls, Miami (6-0-0) controlled possession for most of the first half and took the lead in the 22nd minute, when Steinbruch cut through the defense for her team-leading eighth goal. With a two-goal cushion in the second half thanks to Steinbruch’s second blast in the 59th minute, the Boilermakers (3-2-1), who were at one time ranked eighth nationally last season, applied pressure with more players attacking on offense, but failed to find the back of the net. 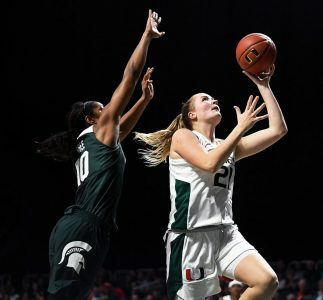 Earlier in the week, Purdue’s newspaper, The Exponent, published an article entitled “Boilers anticipating facing unproved Hurricanes,” in which head coach Rob Klatte implied that the undefeated Canes had faced sub-par competition so far this season. The 26th-ranked team in the nation takes the field again at 7 p.m. Friday night to host Eastern Michigan (2-1-2).